Is the Russian visa included in the cost and how long does it take to process it? Can I have a double bed cabin? Is there a shower / toilet in cabins? Are hair dryers available onboard? What toiletries are available onboard? What entertainment programme do you offer onboard? Is there a special dress code on the ship? What is the DC current on your boats and are there sockets in cabins? What kind of cuisine is on your cruises? If I am allergic or have special dietary requirements, can I still join the cruise? Can you drink tap water on the ship? What money can I use in Russia? Are credit cards accepted onboard? Is there a currency exchange office on board? Do I have to leave tips? Yes, on all our standard tours we include the cost of the Russian visa in the price of your cruise. There won’t be any further charges except for urgent processing. Please read more about the Russian visa procedure in our General Questions section. Please note the standard cabins are the same regardless of the deck and have twin beds. 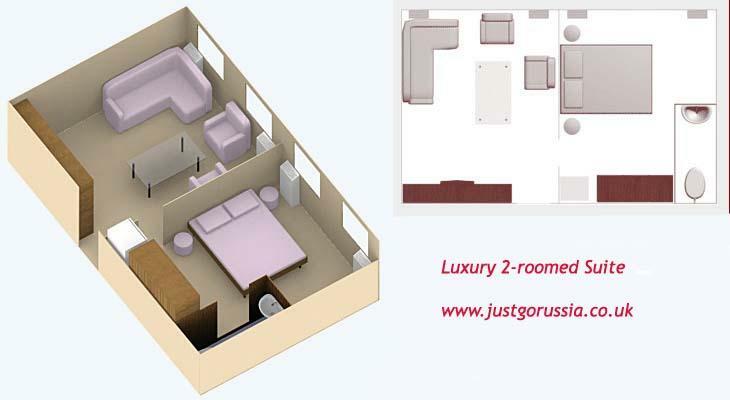 All cabins are equipped with private facilities and a shower, wardrobe, radio, refrigerator and air conditioning. There is a large picture window in each cabin. 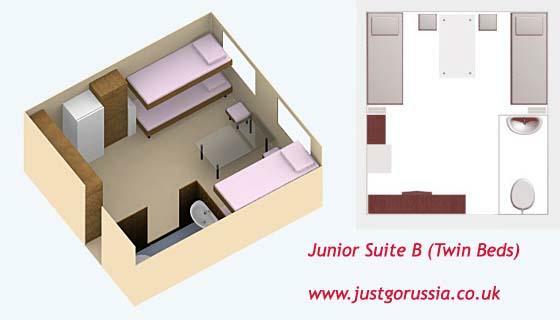 If you prefer more comfort and space during your journey please chose among our Junior Suite Twin Bed and Junior Suite Double Bed. There are also luxury 2-roomed suites with double hotel-style beds and large living area for more demanding travellers. Yes. All cabins are en-suite: there is private “marine-style” bathroom with shower. The shower-head extends from the basin (can be attached to the wall) and is separated from the lavatory by a shower curtain, however there is nothing on the floor separating the shower from the rest of the room. 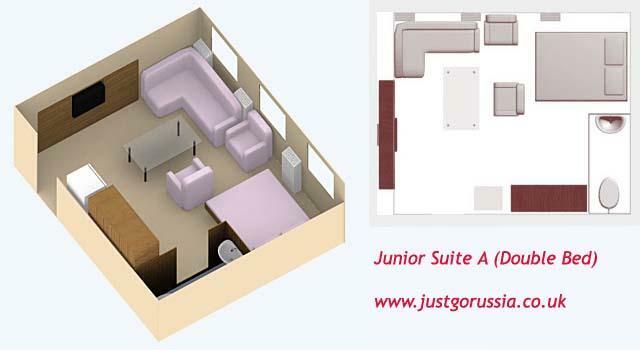 Suites and junior suites feature either a shower cabin or a bathroom. Yes. 4* and 5* ships (MS Rostropovich) – hair dryers are available in all cabins. 3* ships – standard cabins: hair dryers are available at the ship reception and can be provided upon request; luxury cabins (junior suites and suites): hair dryers are available in the cabins. Toilet paper and soap: available on all ships in all cabin classes. Shampoo, shower gel: 3* ships – in junior suites and suites, 4* and 5* vessels – in all cabin categories. Unfortunately, no. Please make alternative arrangements for internet access and emails. For example, you can use your smart phone and set up an email account and internet access. Alternatively, you could find an internet café, wi-fi zones in bigger towns and cities along the route. Please note although there may be wifi connection in one of the ship bars, internet works in test mode and is not guaranteed. The signal strength also depends on the location of the boat. In lakes and water reservoirs the connection is very poor. No. We also recommend to have smart casual clothes for the welcome cocktail and captain farewell dinner. Please also note that during some excursions you will be taken to the active churches and monasteries where strict dress code rules apply. You won’t be allowed to enter in shorts, women must have a scarf to cover their heads. What is the voltage on your boats and are there sockets in cabins? Standard voltage is 220v. All cabins have 2 pin socket, please bring a 2 pin European adapter with you. Please note smoking is prohibited everywhere inside the ship, including bars and open decks (with the exception of special smoking area). Smoking is allowed only within the designated smoking areas clearly marked. Our cuisine is combined offering Russian and international food. Your Russian river cruise is full-board (three meals) including dinner upon arrival and breakfast on the departure day. Note: dinner is served until 11 pm on the arrival day. For those who arrive after 11 pm boxed meal will be provided. Yes. Our cooks can adjust the menu to your special needs. Please advise us upon booking of any dietary requirements. When onboard please contact the restaurant staff and identify yourself. We also recommend to use the same table as it would be much easier for the staff to serve your food as they will remember your seat. However, we recommend that you contact the restaurant staff once on board to reconfirm your requests. The boat restaurant will make its best endeavours to fulfill your special dietary requirements however special requests cannot be guaranteed. The restaurants are not equipped to prepare or serve kosher or halal cuisine. If you have any concerns regarding food please ask your travel consultant when making a booking. You will need Russian Roubles (RUR), and you can even get them in your home country. Please enquire at your local post office or currency exchange agents. However, it is simple and convenient to change either Euros or US dollars once you arrive in Russia - there are “obmen valuti” (currency exchange) booths on nearly every street corner in St. Petersburg and Moscow. Other types of currency can only be changed in a bank. Traveller’s cheques can be changed, but often with difficulty. All major credit cards are generally accepted in Moscow and St. Petersburg, but not in the provinces. Currently there are no restrictions for amounts of money that can be brought into Russia. Any sum of money over $10,000 brought into the country (including traveller’s cheques) must be declared at customs. Individual residents are allowed to export foreign currencies in a lump cash sum up to $10,000. All exported cash assets above $3,000 must be declared. Yes, Visa and Master cards are accepted. An account can be set up for every passenger and you must clear your outstanding balance one day before your departure. No. You can exchange money during your sightseeing programme in cities and towns along the route. Many cruise passengers do leave tips to show appreciation for a job well done and this is certainly acceptable. Such gestures are voluntary and at your sole discretion. If you really enjoyed your cruise and liked the service onboard we recommend EUR5-6 per person per day. Please note, this figure is just a guidance, the final amount is entirely up to you. At the end of your cruise you will be given an envelope where you can put the tips.